You are currently browsing articles tagged Brazil. Maybe it’s because we are both feeling the nasty pain of too much wine last night but right now I am really missing my coconut water – the world’s best natural hangover cure. Brazilians drink agua de coco like it is going out of style and you will find fresh coconuts stacked high on nearly every street corner ready to be struck open by three deft machete chops. Apparently you need one coconut for a regular-sized hangover (two if you got blitzed) to start your recovery. Cool and refreshing, with a hint of sweetness, coconut water rehydrates your body – at least that is what the Brazilians claim. Naturally fat-free and low in calories coconut water contains 5 essential electrolytes. It is a great alternative to drinking fluorescent-flavoured sports drinks that claim to make you fly. If you cannot find the real thing or don’t want to drive with a coconut in your hand, Kero Coco is the next best choice in Brazil (in the US you can track down some here). I can eat a whole box of these in about five minutes flat. Tom tells me I have to savour the flavour by sucking instead of chewing but tic tac etiquette be damned. 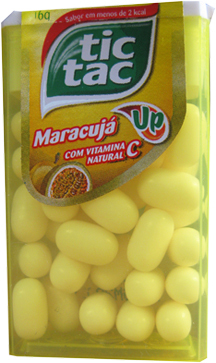 These tasty Passionfruit flavoured Tic Tacs can be found in both Colombia (maracuya) and Brazil (maracuja), they have a soury-sweet flavour that makes them instantly addictive and they also claim to have vitamin C so they are undoubtedly good for you. These treats are great to have kicking around when you are on the road with nothing to eat… having more than one box helps… I buy five at a time. Rio is intoxicating. The vibrancy of the city, the diversity of the people and the laid-back feeling have created a delicious energy that sinks into your veins making you crave more. Its addictive quality has me seriously thinking about how we can spend more time there again… soon. John and Nina, of the fabulous Rio Dolphin Inn, made us feel at home in their cozy bed and breakfast. Not only do they run a great inn but they are both passionate about Rio and have tonnes of tips and ideas on what to do when you visit. 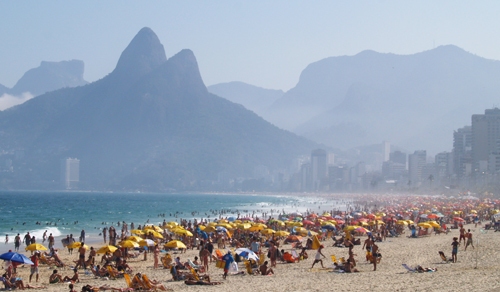 Ipanema is where it is at for sun-worshippers. Break out your umbrella, grab a coconut water, your itty bittiest bikini (or teeny weeny shorts for the men) and settle in for some serious people watching (my fave activity anywhere). Or, for the more active, jog along the boardwalk, play beach volleyball or surf. This is winter in Rio… it’s a rough life. Carnaval is months away but for those involved behind the scenes it actually starts about 8 months earlier. One of the first things that a samba school needs to do is choose a song for the upcoming Carnaval. Songwriters have a chance to submit original works of music to their school. The songs are then performed and a long process of choosing “the” song begins. We went down to one of the biggest samba schools in Rio for their first night of song selection. Being typical westerners we arrived around 11pm but the party didn’t really begin until 1am. Insanely loud music, sassy samba dancers competing like preening peacocks and loads of drinking kept that party going all night long. Samba school gets ready for Carnaval from Kels M on Vimeo. 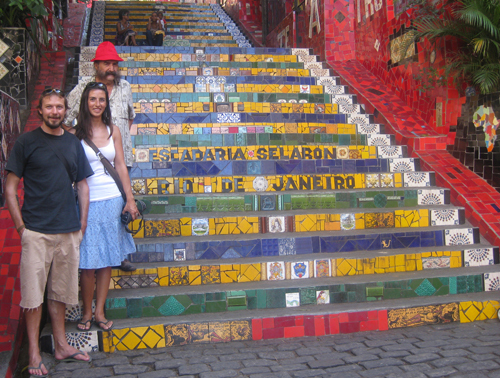 “The Great Madness”, 215 ever-changing tiled steps, is Chilean artist Selaron’s life’s work. Starting in 1990, he began to tile the steps in Brazil’s national colours as a tribute to the country’s people. He kept on even when he couldn’t pay rent or utilities and now, 20 years since he started, numerous photoshoots, magazine interviews and thousands of tiles later Selaron is still working on his masterpiece. Tiles have been sent from all over the world and you can find one from just about every country. We stopped by for a look and found Selaron hanging out on his steps, not much of a talker he did agree to have a photo taken with us. He has said, “This crazy and unique dream will only end on the day of my death” and so he can usually be found working most days exchanging old tiles for new. 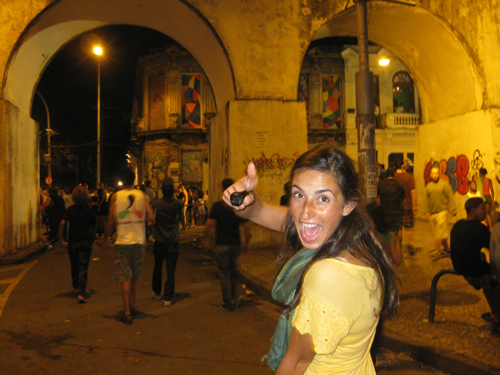 On Friday nights the place to party is the Lapa district, close to the Rio’s old aqueducts. Our taxi left us there around 10:30pm and the streets were packed with hundreds of people, all waiting for the night to begin. After buying $2 caipirinhas from a street vendor we heard the seductive pounding beat of drums and headed over to investigate. A full bateria (the drum section, the beat behind the samba) was playing on the street, and they had everyone moving to the groove, before long the group turned and marched into a club with the lively crowd following. Not wanting to miss out we joined them and busted some dance moves of our own though we were definitely put to shame by the Brazilians who seem born with an innate ability to move well. We finished the evening off with maracuja (passionfruit) caipirinhas at a small club listening to sultry bossa nova . Partying in Lapa from Kels M on Vimeo. High at the top of the Pão de Açúcar (Sugar Loaf) you can enjoy a drink and check out the view of Rio de Janeiro and the Christ statue. Built in 1912 and rebuilt in the early 70s the cable car takes visitors high above the city. The awesome view is so iconic it is definitely a must-see.